Huangling, one of China's most beautiful countryside villages located in Wuyuan County, is upgrading its Flower Town program by introducing an all-season flower-viewing tour to visitors. The new tour will highlight the fusion of local ecological systems and the 580-year-old rural setting, bringing a floral lifestyle experience to people from around the world. 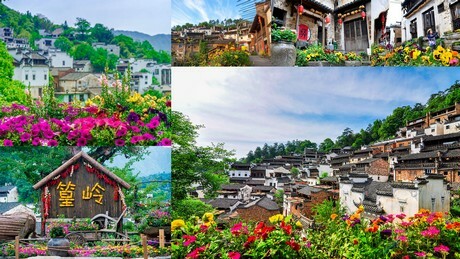 "The Flower Town is a key project in our plan to introduce every aspect of Huangling to visitors, in addition to Wuyuan's already well-known rapeseed flowers which paint the town yellow," said Wu Xiangyang, CEO of Wuyuan Rural Culture Development Co., Ltd. "The new tour will add more colors to visitors' experiences and allow them to enjoy the pastoral blossoms in the fields and hillside terraces not only in the early spring but at all times of the year." Arrangements of pansies and morning glory have also been introduced to the ancient, 300-meter-long Tianjie Street, the central axis that takes visitors up along rooftops and down the hillside. The decorations will shift throughout the year, including near harvest season, following the unique local folk tradition of shaiqiu, or "crops dried in mid-air," as villagers sun-dry their harvests and produce like hot chili peppers, pumpkin slices and chrysanthemum flowers in bamboo baskets on roofs across the village to preserve them.